This 9 x 5 mobility scooter garage proves to be the perfect place to store your mobility scooter. It will be kept safe from the bad weather and also out of reach and sight of thieves. 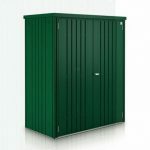 Constructed using some very high quality galvanised steel and then coated with PVC, it is naturally strong and robust, and easily takes care of your scooter storage needs. A huge part of what makes this such a robust structure is that very impressive frame that runs through it. Flooring is actually included with this so there is no extras that you need to worry about purchasing. There is a special 25-year manufacturer guarantee for this unit, so you have even more peace of mind that comes with knowing that your purchase has been guaranteed. While this is something that certainly would make for one fantastic looking and very practical garage, the truth is this actually could be used as a place for general storage. Its generous amount of floor space and height makes it something that really could be used for a number of different things. 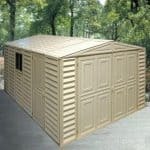 The height of the structure means that you will be comfortable when you spend time in here so even using it as some kind of workshop would be possible. While the Trimetals Mobility Scooter Garage was clearly designed with being a practical and easy to use place for a person to store their mobility scooter, this would actually work very well as a general storage garage where its generous size would allow you to store many items. This generous size also means that storing a security scooter in here is going to be nice and easy and not require precision driving to get it inside. The driver will have plenty of room to get the scooter in and out. The width is 5 feet 7 inches and the depth a very impressive, 9 feet 3 inches so as you can see it is far larger than even the biggest mobility scooter. At its highest point the roof is 6 feet 11 inches which means there will be no need for a person to watch their head as they got off the mobility scooter. There is an electrical mounting bracket included so you could actually set this up so that there is electricity in the garage so a mobility scooter could be charged while it is sitting inside here. 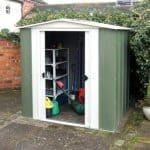 This is a pent style roof which is going to do a fantastic job of protecting your scooter or items that you have stored inside. We really like how they have made sure the rain is going to run off the side of the roof and away from the person trying to get into the garage. The roof is made with galvanised steel panels which are incredibly strong, but also rather light so installing them is going to cause you no problems. The roof is also designed so that it allows air to get into the garage, reducing the chances of condensation as a result. 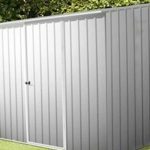 A huge part of the appeal of the Trimetals line of garages and other structures is that fantastic galvanised steel which is used in its constriction. The cladding is actually coated in this very high quality PVC which gives it a very nice look, it actually almost has an overlap cladding type of look to it which we really like. If you take a close look at the pictures then you can see inside the garage there is a solid and good sized galvanised steel frame. This is one very impressive frame and it is going to keep this structure solid for many years. While the looks of a frame are not something we would normally talk about, we must say that shiny galvanised steel does look quite spectacular. A solid sheet wooden flooring is included with the garage and that is something we were very pleased to see as in most cases a structure like this would not come with a floor. This type of flooring is more than capable of taking the weight of a mobility scooter and pretty much anything else you would want to store in here. 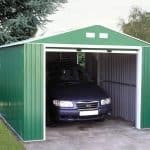 The floor can actually be secured to the ground if you wanted to really give the garage the maximum amount of security. No treatment at all is required with this garage those PVC covered, galvanised steel walls will last for many years and not require any upkeep at all from you. If after a year or two, you feel they are getting a little dirty from the kids kicking a ball at it or some other reason, then cleaning it is as easy as giving it a wipe down with a sponge. As the garage is fire resistant, water resistant and most likely zombie resistant, you are getting a 25 year guarantee with this garage. A guarantee this long shows that they clearly have a lot of faith in their product. The Trimetals Mobility Scooter Garage comes with a large set of double doors. The designers have clearly tried to make it so getting a mobility scooter in here is as easy as possible. The doors are 4 feet 7 inches wide and 5 feet 9 inches high. This is more than enough room to ride a scooter directly into the garage and they also make it so it is easy to get other larger items inside of here. No windows are included with this garage. We do not see this as a bad thing though as those panels do have a great look to them. No matter if you are using this as a place to store a mobility scooter or for just general storage. Any items that you place inside of here are going to be kept safe and sound. The doors close very firmly, but they actually have a very high quality locking mechanism included with them. As well as the key operated lock a cammed bar ensures that the garage is securely locked at the top and the bottom of the doors as well. The decision to not have any windows was not actually done to save money or even as a design choice. The reason that there are no windows is actually a security and a privacy measure. There is no way for any thieves who may be lurking around to look and see what kind of items you have stored inside here. Due to the materials used in the construction of this garage there are not any customisation options for you. However we are sure you could have a little fun and put your own spin of the garage by organising the inside. No extras at all are required with this and that is always something we like to see. Rather than do it yourself though, we recommend you consult a qualified electrician if you want to have electricity in the garage. We just love this line of Trimetals products and this garage is one of the most high quality products we have seen from them so far. You are getting a 25 year guarantee with this garage so that right away lets you know the kind of longevity this has. One huge bonus of this is that even though you are getting all these years out of this, you do not have to do any kind of maintenance on it. This is the perfect size for storing a mobility scooter. It is large enough that even drivers who are, let’s just say less skilled will be able to drive right into the garage without any problems. Be sure to have a friend who is not totally useless giving you a hand with this and you should have it done in around 4-6 hours. Detailed and fairly straightforward instructions will be included so we do not see you having any problems with this. This is one very expensive way to store your mobility scooter, but it is also one of the most practical ways as well. The materials used really are top of the line and the amount of years you are going to get out of this does make it worth the money. Final Thoughts: We are sure that many of you are going to have a hard time overlooking that high price tag. 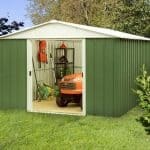 The Trimetals Mobility Scooter Garage is certainly something of a Rolls Royce of storage solutions and while the price is high, we must admit that this really is one very strong, well made and long lasting garage that is going to easily outlast any mobility scooter that is stored inside of it. It has a very attractive design and the fact it requires pretty much zero maintenance is a very nice added bonus. This is something that we really like and if you can accept the price then we are sure you are going to be very happy with it.